Villa Amani provides a luxurious 3 bedroom retreat offering exceptional, panoramic views over Yalikavak. On a small complex of 14 villas surrounded by olive trees and beautiful natural countryside, in central Yalikavak. The villa has a spacious terrace, ideal for alfresco dining and relaxing whilst enjoying the view and watching the sunset. The exceptional garden is laid to lawn with selection of local flowers, geraniums, bougainvillea, citrus trees and a separate palm tree garden. 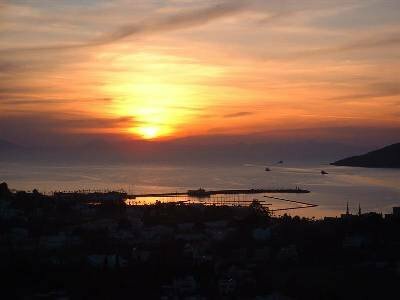 The Bodrum peninsula boasts 14 top quality beaches! and its is a short walk to the beautiful beach at Yalikavak. The villa has been tastefully furnished throughout and is very well equipped (we use it as our own holiday home). It offers light and spacious, air-conditioned, open-plan living, dining and kitchen area with high ceilings. Large windows, patio doors and superb galleried landing offer stunning views over Yalikavak, the Aegean sea and sunsets. The lounge area includes an lcd satellite television with English, European and International channels. A dvd-player is also provided. The large dining area can easily seat up to 6 people. The exceptional kitchen is fully equipped including fitted gas hob, oven, microwave, large fridge-freezer, fitted dishwasher and automatic washing machine. Separate downstairs wc. A feature marble staircase leads upstairs to three good-sized, air-conditioned bedrooms. The master bedroom has an ensuite shower room and large patio door leading to a private balcony. Two further bedrooms 1 double and 1 twin. So, can sleep six in bedrooms and two downstairs on sofa. Wardrobes, drawers and dressing tables provide ample storage space. The spacious, fully-tiled family bathroom includes a double walk-in power shower. The views over Yalikavak bay can be fully appreciated from the unique galleried landing. All bedding and towels are provided. Fully integrated boiler provides on-demand hot water. Garden is laid to Lawn ideal for outdoor games.